Microsoft just published its first quarter financial year 2017 results, or FY17 Q1 results for short. The results were excellent overall and Microsoft stock has hit an all time high. Earnings were above estimates and thus the shares have gapped up (as much as 6 per cent) in afterhours trading. Key to the success seen in FY17 Q1 were the stellar sales of Microsoft's flagship cloud product. 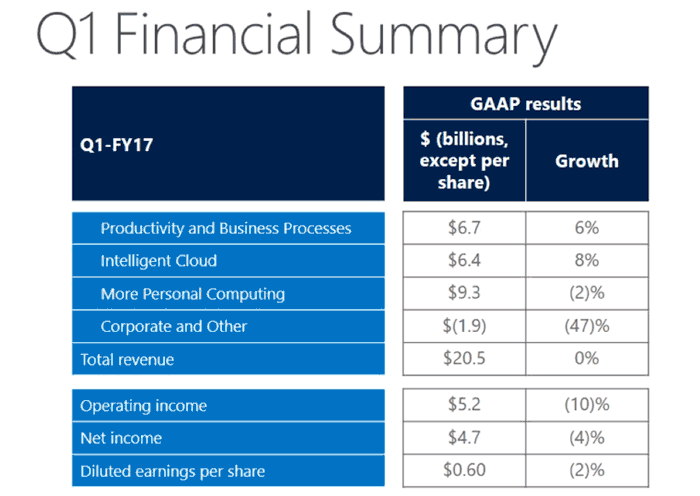 'Intelligent Cloud' was Microsoft's best performing business segment growing 8 per cent in total and bringing in $6.4 billion in revenue. The next best performer was the 'Productivity and Business Processes' segment which includes Office and Dynamics products, raising $6.7 billion in revenue. Windows OEM revenue was flat year-over-year (flat in constant currency), slightly ahead of the PC market. Windows commercial products and cloud services revenue was flat year-over-year (up 2% in constant currency) driven by annuity revenue. Phone revenue declined 72% (down 71% in constant currency). Gaming revenue declined 5% (down 4% in constant currency) driven by lower Xbox console revenue offset by higher Xbox software and services revenue. Search advertising revenue excluding traffic acquisition costs grew 9% (up 10% in constant currency) driven by increased revenue per search and search volume. Hidden within the above More Personal Computer data are excellent sales of the Surface branded devices. 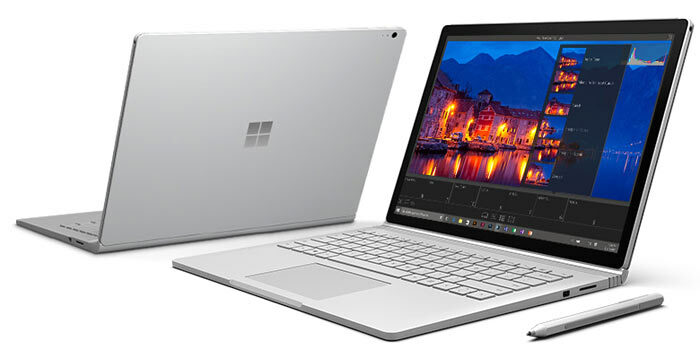 In the latest quarter Microsoft sold 38 per cent more Surfaces than in the same period a year ago, bringing in $926 million of revenue. Of course it is the Surface 4 Pro and Surface Book which are largely responsible for this success. Microsoft's CEO, Satya Nadella noted that enterprise orders of 500 or more Surface devices increased by 70 per cent in FY17 Q1. 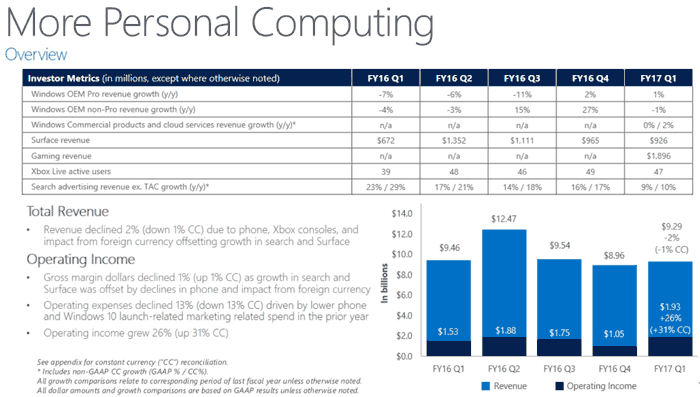 The Windows Phone disaster is clear to see in the bullet points above – revenue down again, this time by 72 per cent. Digging through past financials NeoWin helps illustrate the scale of this decline. In FY15 Q1 Windows Phones generated $2.6 billion in revenue, a year later in the FY16 Q1 report the revenue dipped to about $1.1 billion, now another year later calculations suggest the FY17 Q1 figure for Windows Phone revenue is around $300 million. Microsoft's outlook for FY17 Q2 is positive across all its business segments. Last but not least, Microsoft expects to close the LinkedIn acquisition deal in FY17 Q2. This showed up as “Microsoft results show Surface sales jump by 38” in my small browser window. Gave me a chuckle.